I’ve been spending a lot of time working on my iPad instead of traditional art supplies the past few weeks. I like the option of going back and forth between traditional and digital illustration. It’s so convenient to work on the iPad, but soon enough my paints will be calling me back. I just walked down into my studio yesterday and there’s a painting I’m half-finished sitting on my work table. I need to get back at that, but I’m into this mode of digital work right now. I’m loving it, and so I think we should do whatever makes our hearts the happiest. This is making my heart happy right now. When I’m working in Procreate on the iPad. For those that are not familiar with Procreate it’s a drawing/painting app specifically for use with the iPad Pro with the Apple Pencil. Anyway, when I’m using Procreate the app itself comes with a handful of good brushes and since purchasing the iPad, I’ve been drawn to the gouache brush. Recently though, I stumbled onto a brush pack that is solely for gouache and it is exactly what I have been looking for. I’ve also purchased a watercolor set, but I’m still playing around with that set to make it feel more like my traditional watercolor work. If I can get that to work out, I’ll be really happy about that too! For this piece, I decided to give myself a little challenge of working on a landscape. I can’t really remember the last time before this, that I really put my heart into working on a landscape. I always paint things, and I’m not really sure why, but typically I work on single things. I chose a tropical landscape for my love of Hawaii and all places tropical, but also because I could include a little bit of everything in one colorful landscape. I enjoyed it so much that I think I want to work on more landscapes. 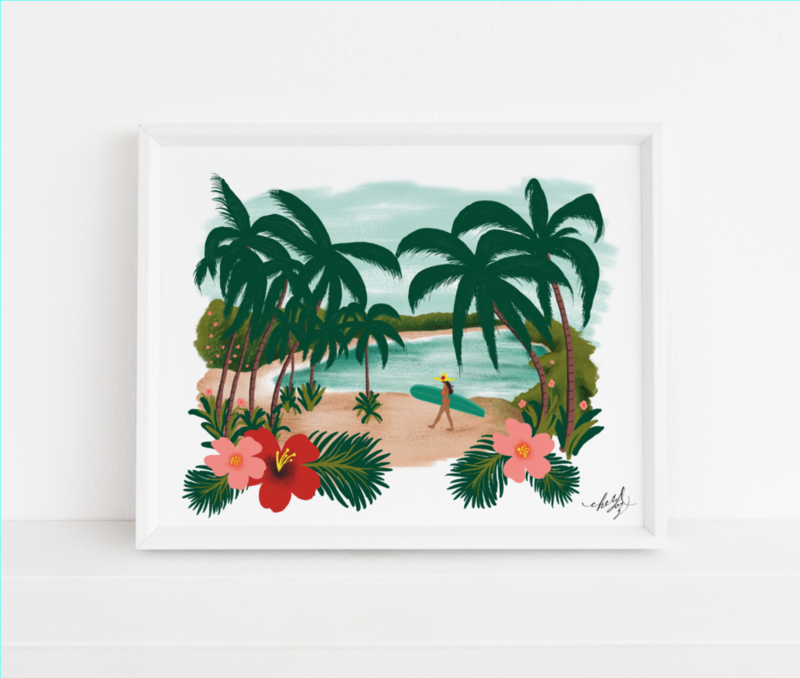 The Paradise art print is available for purchase in my Etsy shop in 8x10 and 11x14” sizes. The print is sold unframed. Logo will not be printed on the image. we made it thru the winter! i’m so happy to be back walking our dogs daily and enjoying more time outdoors. i love seeing the seasonal change, greener grass, the tiny flowers poking thru the ground, birdies chirping in the morning, and the neighborhood bunnies scurrying about. having more sunlight thru the evening makes for more time spent on our patio in the backyard, dinners al fresco, bike rides and evening strolls.